The term 'pirate' means "one who plunders on the sea", but those who led this life fell into several categories. Privateers were sea-raiders with a government licence to pillage enemy ships. Buccaneers were pirates who plundered the Spanish in the Caribbean and Corsairs roved the Mediterranean in search of gold and other treasures. 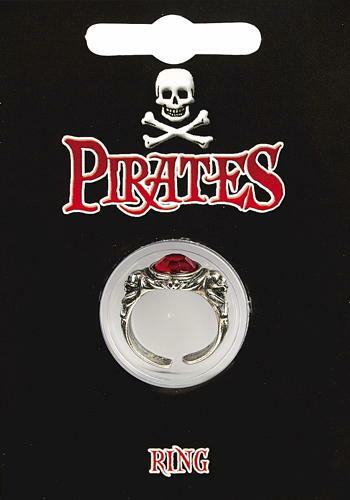 This Pirate Gem ring with skulls on it is made from lead-free pewter and is supplied with either a red, green or blue gem. The information card is full colour on the front and has historical information on the reverse. Pewter snake ring supplied in a clear blister on an information card which describes how the snake design was popular throughtout Roman times. Pewter knight's gem ring supplied in a clear blister on an information card which explains about knights and system of apprenticeship. Pewter gem ring supplied in a clear blister on an information card which explains about Tudor jewellery and a brief history of Henry VIII. Pewter serpent ring supplied in a clear blister on an information card which describes how serpents and other mythical beasts were popular in Roman times.